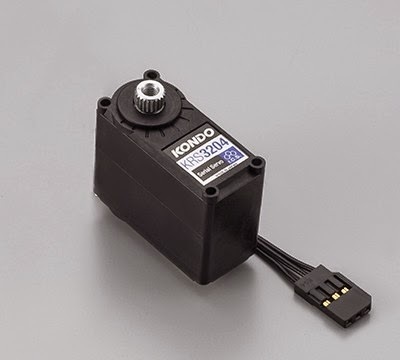 KONDO KAGAKU CO. LTD. announced a new small servo, KRS-3204 ICS would be put on the market late in October. KRS-3204 ICS is a small servo of the standard type design. The servo is using a coreless motor and the output maximum torque is 9.3 kgf・cm (7.4V time) of the top-class with the mini-servo. 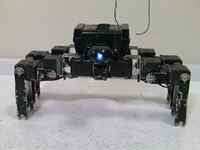 Metal gears are adopted to secure the durability when the servos are used in biped robot. 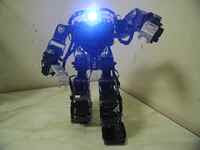 The servo will ship out and be gotten from KONDO web shop or robot shops by late in October. ※This product is a servo for 6-7.4V. It does not support battery for HV. ※Not for the daisy chain connection between servos. ※When you use it in RCB-4HV, please prepare a divergence board. ※When you use it by Ni-MH5 cell (6V), the combination of RCB-4HV/3HV and Li-Fe2 cell (6.6V), please use booster 3 (voltage up circuit). In the case of the use, it is not particularly necessary in Li-Po2 cell (7.4V). ※The initial setting is PWM mode. When you use it with a serial number, you use Dual USB adapter HS or ICS USB adapter HS and ICS manager software, and, please set mode reshuffling and the ID number. Because it is PWM mode at the time of the shipment, even the microcomputer board of other companies is just connected and is available. The exhibition match of Chibi-Meta and Garukid, which were biped robots using KRS-3204 ICS took place in the KHR 10th Anniversary.